Virtual Rome is an ambitious digital model of the entire ancient city, developed by Reading Classicist Dr Matthew Nicholls. Dr Matthew Nicholls is Associate Professor of Classics in the University of Reading’s Department of Classics. He is interested in the political and social history of the Romans and the way that the built environments of Rome itself, and Roman cities around the empire, expressed their values and priorities. He also has an interest in computer modelling as a way of exploring ancient structures and bringing them to life for students, fellow researchers, and the public. His huge, detailed digital model can be used to generate images and animations of the ancient city or buildings within it from any angle, at any time of day or year. The research potential of the Virtual Rome model is enormous – it can be used, for example, to investigate questions of sight lines, illumination, and routes through the ancient city. For example, this recent post by Dr Nicholls explains how “Roman fragments and digital modelling shed light on urban spectacle” – it shows how using the model to display the stage buildings of Rome’s theatres at different times of day helps us understand how ancient shows were scheduled. The model has already attracted considerable interest from journalists and broadcasters; the Gallery page shows some of its uses in documentaries and publications. Dr Nicholls welcomes enquiries. The Virtual Rome model is already proving invaluable teaching tool, used for undergraduate and postgraduate courses within the University of Reading and further afield, including on field trips to Rome. It is an integral part of a new free online course (or ‘MOOC’): “Rome: a Virtual Tour of the Ancient City“, enabling learners to immerse themselves in the architecture and history of Ancient Rome. Around 20,000 people around the world have taken this free five-week course so far – do sign up for next course run! 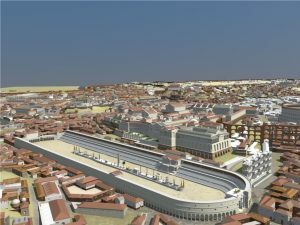 Dr Nicholls has also used the model to illustrate public talks and lectures, giving an insight into the appearance of the ancient city, and involves students at all levels in the research and creation of digital models – a unique opportunity. Dr Nicholls is now working on a model of the local Roman town of Silchester, to which undergraduate students of the University of Reading contribute as part of their course – a unique opportunity. He has also worked with students from the University’s Department of Typography and Graphic Communication to produce a template for a smartphone app. for Virtual Rome and is talking to publishers about books for the student and tourist markets.